It's Showtime for ABACE 2019! Shanghai Hongqiao International Airport is hosting 2019 edition of the Asian Business Aviation Conference & Exhibition. Are you ready for latest products, services, equipment and announcements in business aviation for Asia? Jus to remind you, ABACE is held each year in partnership with the Shanghai Airport Authority (SAA) and co-hosted by The National Business Aviation Association (NBAA) and the Asian Business Aviation Association (AsBAA). “Business aviation” is a term given to describe the manufacture, use and support of mostly small “general aviation” airplanes for business reasons. Given its geographical and other considerations, the Asian region holds enormous potential for business aviation in the coming years. ABACE 2019 will feature more than 150 exhibitors and more than 30 aircraft on display, including pistons, intercontinental jets and helicopters. 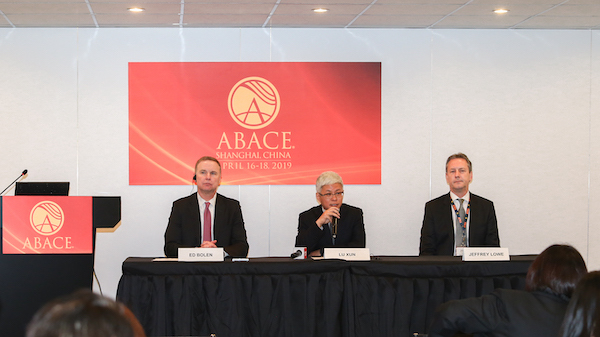 Today, a special ABACE media day briefing for reporters was hosted by NBAA President and CEO Ed Bolen and Lu Xun, Chairman, Shanghai Hawker Pacific Business Aviation Service Center, to provide an overview of this year’s show. Their presentation, at 11:00 a.m. on the show grounds, was augmented by remarks from Jeffrey Lowe, a member of Board of Governors, Asian Business Aviation Association, who provided a 2018 fleet report for business aviation in the Asian region. All three speakers took reporters’ questions at this exclusive media briefing. During the "two sessions" this year, China’s premier Li Keqiang mentioned in the government work report that the Chinese government would expand effective investment as appropriate, closely follow national development strategies, and accelerate the implementation of several key projects, including boosting investment in infrastructure, such as general aviation. According to the "13th Five-Year Plan for Development of General Aviation", China will establish 500 general aviation airports and own 5,000 general aviation aircraft by 2020. As for the current industrial scale, the number of domestic general aviation increased from 111 operators by end of 2010 to 422 operators by end of 2018, while general aviation aircrafts increased significantly from 1,010 in 2010 to 3,229 in 2018. Meanwhile, general aviation airports certified by CAAC increased from 175 in 2010 to 229 by end of 2017. The international embrace of business aviation in Asia will be highlighted by the government and industry leaders participating in the show’s opening keynote session, as well as a panel on the event’s second day, focused on growth at the country’s airports. Specifically, the ABACE 2019 opening keynote will feature: Jiang Chunshui, Party Secretary of the East China Regional Administration of the Civil Aviation Administration of China; Cai Jun, Inspector of Shanghai Traffic Commission; Yun Qin, Chairman, and Xin Feng, President of SAA; NBAA’s Bolen; Weldon Epp, consul general for Canada in Shanghai, and; Sean Stein, consul general at the United States Consulate General in Shanghai.